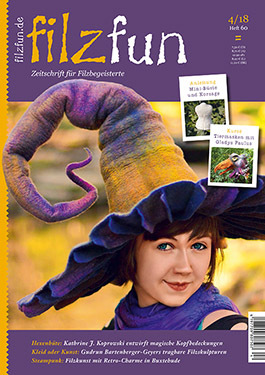 felt artists in the spring issue of the filzfun once more demonstrate the mind-boggling range of creative possibilities that felt offers. 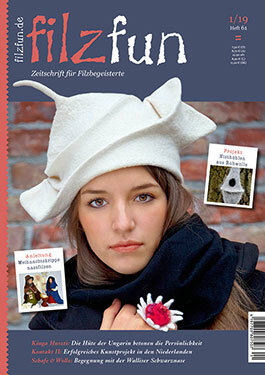 Hats are a classical application field of feltmaking, yet hat does not equal hat: Kinga Huszti creates real works of art out of different kinds of wool, for example our cover model of our filzfun winter issue. 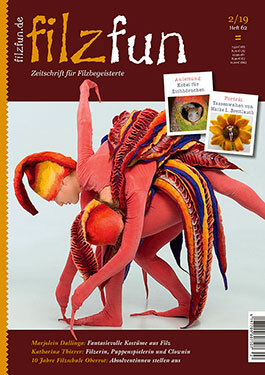 You will find detailed and richly illustrated portraits of the Hungarian feltmaker and her works as well as of Elisabeth Paul, who combines felt and photography in a unique manner. Another portrait introduces the felt and fashion designer Iveta Hruscova from. Stephanie Metz is staging an unusual exhibit in California: Her huge felt installations can, should even be experienced haptically. Susanne Schächter-Heil shares a step-by-step instruction how to wet-felt a nativity scene complete with angels, shepherds and sheep. 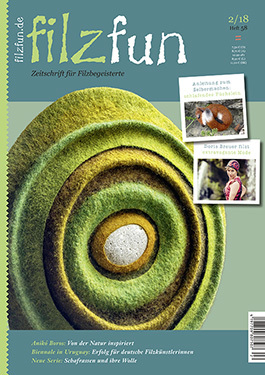 Apart from that, the winter issue offers a lot of news and interesting facts from the world of textile art and feltmaking: Event reports, exhibition gleanings, shows and courses, information about the Wallis Blacknose Sheep and its wool as well as a wealth of different interesting dates and schedules for all felt enthusiasts. to an international felting conference in Sweden, to the »Steampunk verfilzt« show in Buxtehude and the graduation exhibit of the felt academy in Belgium. Let yourself be inspired by such diverse artists as Gudrun Bartenberger-Geyer, Natali Shvets and Yvonne Zoberbier and discover over 200 courses, exhibitions, markets and trips in our enclosed schedule. 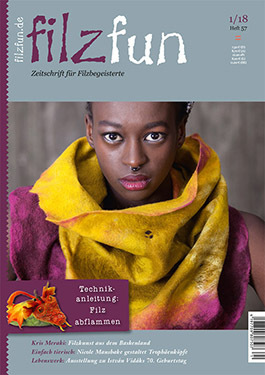 European felting renaissance. 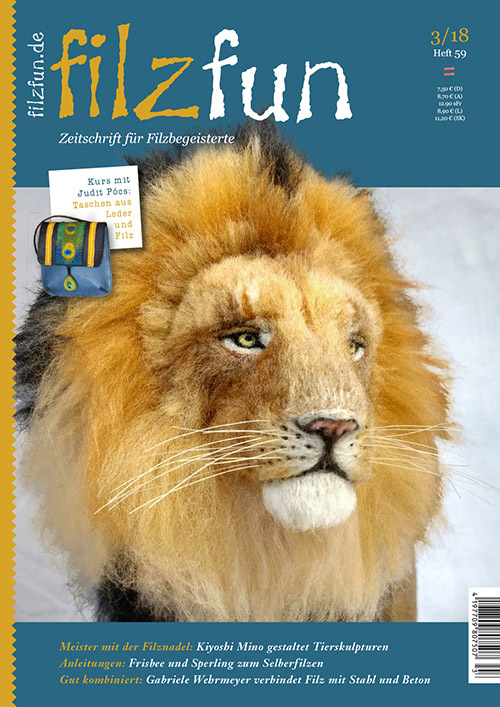 Further we report from the German-speaking Felt Encounter in Detmold, the exhibit »Gehalten & getragen« (Held & Worn) of the Filz-Netzwerks in Marienmünster and we look back to ten years of advanced training offered by the Filzschule Oberrot. by-step instructions how a lovely little fox can be needle-felted. Moreover we bring many exciting news in the fields of felting and textile art, reports from the most important events and exhibitions as well as 200 dates for courses and workshops in our time schedule attachment. and events around the textile art scene, of interesting courses and the history of the Turkmen saddle blankets made from felt. Annette Quentin-Stoll gives instructions how to felt a sitting pad with a chessboard pattern, and Margit Röhm explains how a felted surface becomes smooth by singeing it. In our online shop you can order any available single issue of the FUN and all of our gallery books. So you can easily order the issues which you are missing! We guarantee a fast delivery and secure data transmission. You can choose at the end of your order to pay by Direct Debit or by PayPal (Creditcards).